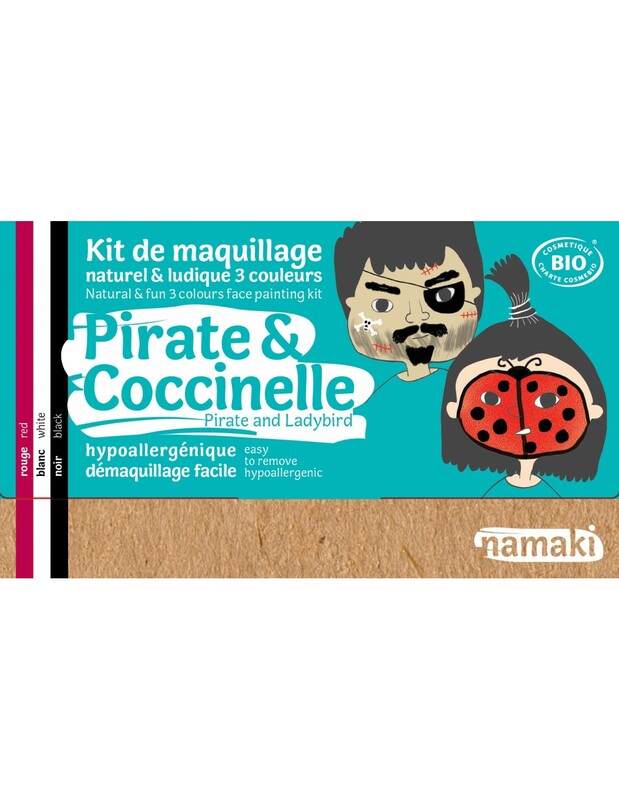 Le kit maquillage coccinelle et pirate est certifié bio par cosmébio. noir, blanc : zea mays starch (zea mays (corn) starch)*, glyceryl oleate citrate, caprylic/capric triglyceride, oleic/linoleic/linolenic polyglycerides, tocopherol, parfum (fragrance), benzyl alcohol, dehydroacetic acid. rouge : mica, zea mays starch (zea mays (corn) starch)*, glyceryl oleate citrate, caprylic/capric triglyceride, oleic/linoleic/linolenic polyglycerides, tocopherol, parfum (fragrance), benzyl alcohol, dehydroacetic acid. Toutes les couleurs peuvent contenir / All colors may contain +/- : CI 77891 (titanium dioxide), CI 77491 (iron oxides), CI 77492 (iron oxides), CI 77499 (iron oxides), CI 77007 (ultramarines), CI 77288 (chromium oxide green), CI 77742 (manganese violet), CI 75470 (carmine).